You don’t necessarily have to have a fully functional bar at home to serve your guests because sometimes, a few beautiful glasses and your favourite tipple will do. This is where unique glassware comes in, as any tippler would tell you that drinking from the right glass definitely makes the drink taste so much better. If you like the Art Deco touch then this is a perfect choice for you, as it can be used for both wine and possibly even champagne as the base suggests. This stunning glass is made without using a mold and with borosilicate glass material to ensure that it is durable. Marble is a very chic and luxurious material so using it as the base of your glass will make it have more weight and feel more glamorous. Besides, this definitely brings a whole new meaning to the phrase for asking for your drinks to be on the rocks! Who says champagne glasses have to be boring and plain? These extraordinary glasses tell a different story as they really jazz up your bar and are so versatile that they can be used for formal and casual events. Here’s another dual function glass that you will really want thanks to its gorgeous design. 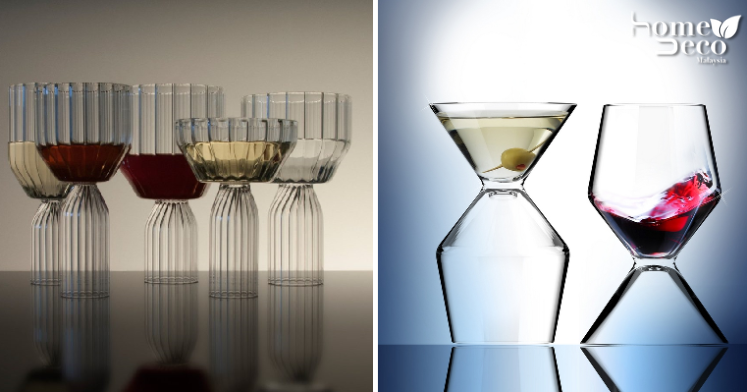 The top is suitable to make those yummy martinis while another side can be used when you just feel like drinking a good ol’ glass of wine. The modest whisky glass is given a new breath of life with some gold accents on the glass that is wound around with complex designs. It will style up your bar table and make a statement in your home. Drinking beer may not often be seen as a classy activity but with these contemporary and sleek glasses, you will look as elegant as anything. They look striking and very beautiful in your hands.